Welcome to BreadMakerMachines.com. Our goal is to guide you through the wonderful experience of bread baking with the simplicity and ease of a bread machine. Whether you bake bread occasionally or depend on your bread machine everyday, we’ll do everything we can to help you enjoy the bread machine experience and your continuing exploration of fresh baked breads. We also feature reviews of some of the most popular bread makers to help you decide on your first machine or the next machine for your bread making pursuits. 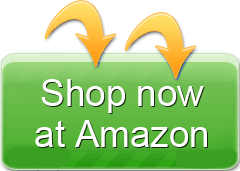 There are links to more information and easy ways to buy a machine online. 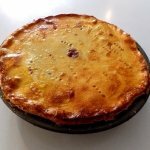 There are also articles and many recipes on all things related to bread machines from new and trending recipes to mastering gluten free, and alternative recipes like jams and jellies that you can easily make in your bread machine. It’s one of the top-of-the-line breadmakers on the market from a company that has been in operation for almost a century. Featuring a unique top-browning feature and two kneading paddles, the Home Bakery Virtuoso bakes a consistent loaf every time. 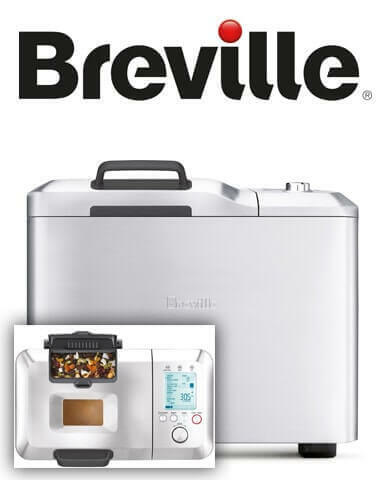 Preprogrammed with 3 crust shades and 10 settings including: Basic, Basic Wheat, Basic Dough, Quick, Quick Wheat, Quick Dough, Jam, Cake, Sour Dough Starter, and 3 homemade menu options. The control panel is integrated with a digital clock that will allow you to set a timer to bake your bread up to 13 hours in advance. 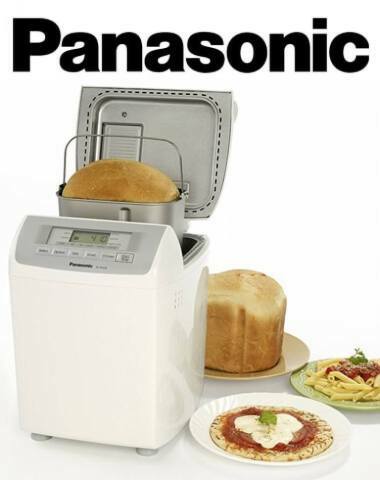 The Panasonic SD-RD250 is a good, general use bread maker for people who want to bake standard bread recipes with the addition of an automatic dispenser for fruits and nuts. The addition of ingredients for fruits and nuts for recipes such as raisin bread requires that those ingredients be added during the kneading process, not before. It bakes 1 and 2 pound loaves with 5 settings that include: Basic, French, Pasta, Pizza Dough, and Bake Only. It also has a preset timer so you can add ingredients and forget about them until you either wake up or come home to fresh-baked bread. 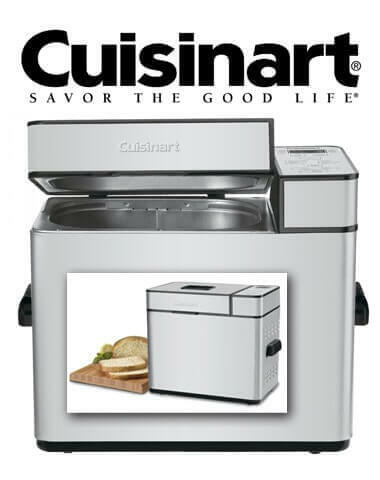 The Cuisinart CBK-100 2-Pound Programmable bakes loaves in 3 sizes including a 1 pound loaf, 1-1/2 pounds and 2 pounds. It also has 3 crust-color settings and 12 preprogrammed settings. A built in timer allows you to delay the baking cycle up to 13 hours. The pan is non-stick and there is a viewing window in the lid. It will bake gluten free and whole wheat breads as well as traditional loaves like white bread and French/Italian breads. It is available in stainless steel and is 14.5 x 7.5 x 12.5 inches and weighs 22 pounds. 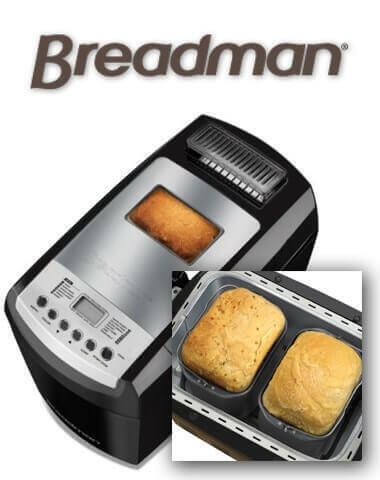 The Breadman BK2000B Bread Maker will allow you to bake two 1-pound loaves of bread simultaneously or a single 1.5-pound, 2-pound or 2.5-pound loaf. 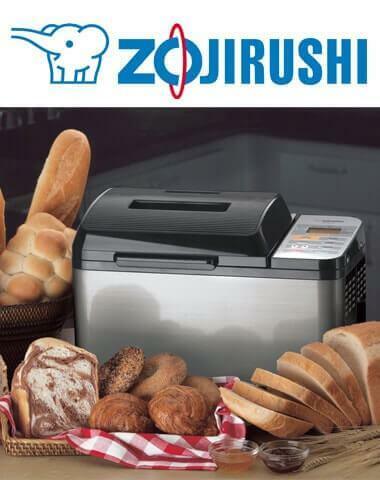 It has 13 pre-programmed baking functions and 3 bread-crust settings including light, medium and dark. It also has a delayed timer that can be set up to 15 hours in advance. The Breadman BK2000B also features two paddles for better kneading and a collapsible paddle designed to minimize the hole in the base of the loaf. In addition, it has an automatic fruit and nut dispenser, a viewing window and settings for gluten-free and whole wheat.